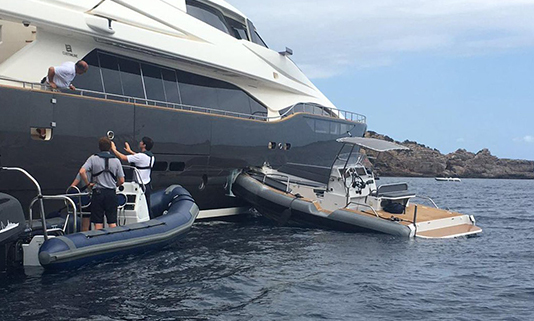 A few weeks ago, on 14 July, a superyacht tender crashed into a 38-metre Ferretti Group Custom Line yacht at anchor in Ibiza. Thought to belong to Le Grand Bleu (a 113 metre previously owned by Roman Abramovich, before he gifted it to friend and business partner Eugene Shvidler in 2006) the tender was said to have circled for 15 minutes whilst doing 30 knots. According to an eyewitness, the two crew members on board fell off and didn’t have a kill cord in place allowing the tender to hit another yacht twice before smashing through an oversized hull window in the Custom Line. It is reported that no one was hurt, although it was a scary, and expensive, incident to witness. This won’t be the first or the last crash in the Mediterranean this summer, neither will it be the only incident involving (suspected) improper use of a kill cord (several observers have pointed out that not all big diesel-powered superyacht tenders have kill cords fitted in the first place) but it does serve as yet another salutary reminder to take every possible safety precaution at sea. The Ibiza incident was quickly discussed on Facebook and various yachting forums, with many quick to blame a lack of experience amongst young yacht crew. Clare Kuszyk, Course Manager at Allabroad Sailing Academy in Gibraltar, an all-encompassing RYA-recognized training centre since 2000, disagrees, and says if a kill cord is in place, lack of experience isn’t an issue. 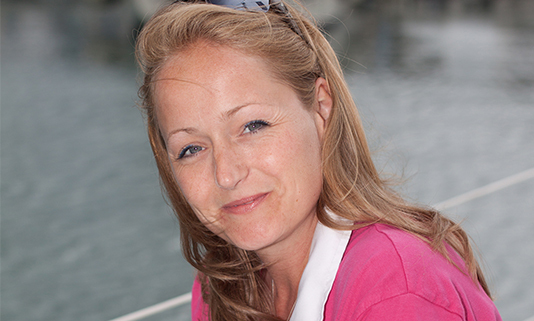 Clare continues, “We recommend that all professional crew wanting to work on superyachts in any capacity undertake the Powerboat Level 2 course for tender operations. A primary focus of this course is the correct use of kill cords and why they are essential in the prevention of accidents at sea. The UK Maritime and Coastguard Agency (MCA) and Royal Yachting Association (RYA) have clear guidelines on the correct usage of kill cords. “In short, the use of a kill cord is essential at all times when an engine is in gear,” summarises Clare, “with best practice being the use of two kill cords when changing helm controllers. Always buy a good quality steel core kill cord and stow out of UV light when not in use. Carry a handheld VHF radio on your person so you can summon help in the event of being thrown overboard and always wear a lifejacket to help prevent drowning. Small open powerboats are generally fitted with a kill cord which, if used correctly, will immediately stop the engine should the driver become dislodged from the helm. The red lanyard has a quick-release fitting at one end and a clip at the other and should be worn whenever the engine is running. The RYA recommends you check your kill cord works at the beginning of each session by starting the engine and then pulling the kill cord to make sure the engine stops. You should also keep an eye out for wear and tear, kill cords can become stretched, rusted or brittle – especially if (incorrectly) stored open to the elements.